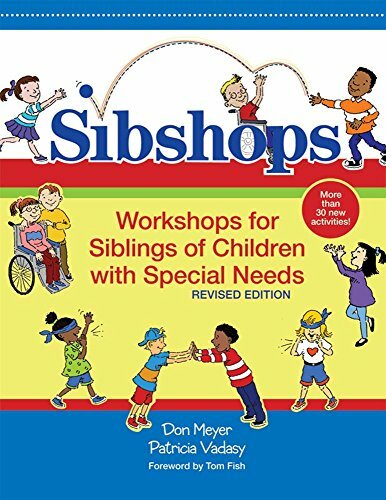 Sibshops is a guidebook for organizing and conducting workshops for siblings of children with a broad variety of special needs. These workshops provide children and young adults with much-needed social and emotional support from their peers in a recreational and fun atmosphere. They can speak openly about how they feel (positively and negatively) about having a brother or sister with special needs in an understanding and supportive environment. New additions to the second edition include a chapter on Sibshops Standards of Practice, advice for service providers and parents from siblings, and techniques for adapting the program to younger children or teenagers. "Parents and teachers will glean valuable insights with or without a Sibshops program." Don Meyer, M.Ed., Director, Sibling Support Project, 6512 23rd Avenue NW, Seattle, Washington 98117 Don Meyer is the director of the Sibling Support Project, a Seattle-based national project dedicated to the lifelong concerns of brothers and sisters of people with special health, developmental, and mental health concerns. A sought-after speaker, Don has conducted workshops on sibling issues and trainings on the Sibshop model in all 50 states and in seven countries. He is the editor of The Sibling Slam Book: What It (TM)s Really Like to Have a Brother or Sister with Special Needs (Woodbine House, 2005), Views from Our Shoes: Growing Up with a Brother or Sister with Special Needs (Woodbine House, 1997), and Uncommon Fathers: Reflections on Raising a Child with a Disability (Woodbine House, 1995). With Patricia Vadasy, Mr. Meyer wrote Living with a Brother or Sister with Special Needs (University of Washington Press, 1996). His work has been featured on ABC News and National Public Radio and in Newsweek, The New York Times, and The Washington Post. Don is married to Terry DeLeonardis, a special education preschool teacher and consultant. They have four children. Patricia Vadasy, Ph.D., is Senior Researcher at Washington Research Institute in Seattle, Washington, where she conducts research on early reading instruction. She is most interested in research that may help children at risk for reading disabilities and children who are English language learners. Patricia and her colleagues have developed programs that paraeducator tutors can effectively use to supplement reading instruction for beginning readers.